The interim government is to strip the powers of the Fiji Law Society. 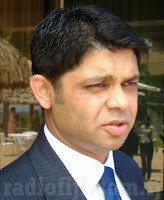 Sources say the interim attorney general and acting prime minister, Aiyaz Sayed Khaiyum, who is also the minister of justice, will also become the licensing authority for lawyers. The Fiji Law Society issues licenses to lawyers under the Legal Practitioners Act but sources say a decree will be promulgated to limit their authority. Coupfourpointfive has been told Sayed-Khaiyum intends to punish the Law Society, because its President, Dorsami Naidu, has been a vocal critic in the recent dramas. Naidu was last month detained for a little over 24 hours after speaking out against the regime, following the sacking of the judiciary on April the 10th. Our legal sources say that if the interim attorney general becomes the licensing authority then well known lawyers like Dorsami Naidu, Tupou Draunidalo, former vice president Ratu Joni Madraiwiwi, Graham Leung (both lawyers with the firm of Howards), Richard Naidu, Florence Fenton, Jon Apted (all of Munro Leys), Niko Nawaikula, Akuila Naco, to name a few, are likely to be discriminated against and may not be issued practicing licenses. These lawyers have criticised the military regime. At the moment, the Law Society issues annual licenses for between $500-$700, depending on their experience. To obtain a license, lawyers have to accumulate 10 hours of continuing legal education every year, mostly by participating in legal conferences organised by the Society. And every year the lawyers who are mostly in private practice need to have their trust accounts audited then submitted to the Law Society and the attorney general. This is similar to the policy adopted by the Fiji College of General Practitioners, the regulating authority for GPs. (doctors in private practice and public service). The Health Ministry has no say in this regard except to ask the Public Service Commission to conduct disciplinary proceedings against doctors accused of medical malpractice, like the widely-reported case of five year old Shavneet Kumar, who died in September 2007. The powers of the Fiji Law Society have already been curtailed with its exclusion from the Judicial Service Commission, constituted under the Administration of Justice Decree. Under the decree, the Society has no say in the appointment of judges of the High Court, Court of Appeal and Supreme Courts. Under the 1970, 1990 and the recently abrogated 1997 Constitutions, the Fiji Law Society was a member of the Judicial (Legal) Service Commission. The Society has more than 350 lawyers - more than half of them are indigenous Fijians. What next? He wants to decide on the judges, now lawyers, next the jury and who can take their grievances in court! Aiyaz, there is so much that people can forgive you for, but what you have gone and are doing now is beyond forgiveness. You will just have to go straight to prison when we get back to our footing. Just pray that the angry crowd doesn't shred your body to pieces before you reach your cell. How come this idiot still have the guts to speak during this time. Goodness me he left Fiji and now he is speaking as if he owns the country...You are so lucky that no one has beaten you up yet!! I think he is asking for trouble! !